The NYC Sample Sale 2014 Calendar is finally starting to see some action! 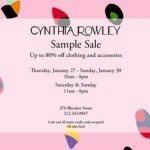 January 2014 Sample Sales include Cynthia Rowley, Theory, Helmet Lang and February already has 4 sales on the calendar, Comptoir des Cotonniers, Marni and others, with more being added daily. You won’t find information about New York Sample Sales 2014 in any printed tour guide, because it is almost all by word of mouth and rarely publicized more than a few days in advance.